The calculate_gsea.pl program take GWA association results (chi2 and P values for all markers for at least 1000 phenotype permutations), a SNP-to-gene mapping file, and a pathway annotation file to perform pathway-based association tests. The algorithm is adopted from the Gene Set Enrichment Analysis software (Subramanian et al. Gene set enrichment analysis: a knowledge-based approach for interpreting genome-wide expression profiles. PNAS, 102:15545-15550, 2005) with certain modifications. Briefly, the method does not focus on the top 20-50 SNPs with the strongest evidence of association; instead, it looks at all SNPs (and their neighboring genes) and sees whether SNPs within a particular biological pathway show consistently, albeit subtle, trend toward association. As there is no straightforward way of condensing test statistic from multiple SNPs into a statistic value for a gene, the method simply assign the best P-value of all SNPs near a gene to the gene but use phenotype-based permutation for adjusting statistical significance. The most significantly associated pathways can be identified from a set of candidate pathways, together with statistical significance calculated from permutation procedure. The algorithm and software may be further improved and extended to be more sensitive and powerful. 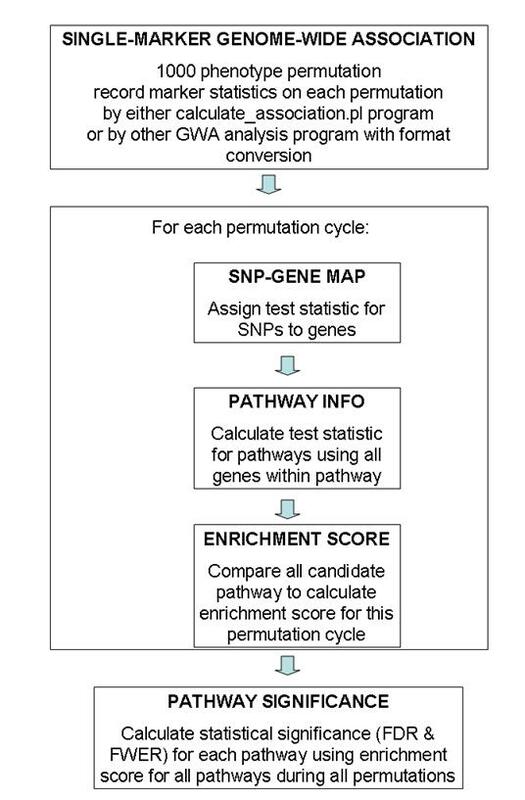 Several areas of improvements may include: (1) better method for condensing test statistic for SNPs to test statistic for genes; (2) better testing statistics for enrichment analysis that takes into account of overlapping pathways and is more powerful than the default Kolmogorov-Smirnov-like running sum; (3) possibility of skipping the snp-gene mapping step and directly test on SNPs within the same functional pathway; (4) use directed acyclic graph or interaction network to take into account of gene-gene correlation and interactions; (5) better pathway-annotation, especially taking protein-protein interaction data, transcriptional network data and other types of relationship data for testing candidate pathways; (6) combining multiple data sets (possibly with different genotyping platform) on the same or similar disease for pathway-based association tests. We believe that the further development of pathway-based approaches that incorporate and weigh prior biological knowledge, including those gleaned from model organisms, will greatly facilitate the interpretation of GWA data and will lead to the identification of novel disease susceptibility genes and mechanisms. To read the detailed documentation of the program, one can use the --man argument when running the program. To see a list of arguments and their functionalities, one can use the --help argument when running the program. When the program is issued without arguments, it will print out abbreviated usage information, including supported arguments (Try to do it now to see a list of currently supported arguments and their functions). Note that you can use both double dash or single dash in the command line (so --output has the same meaning as -output), and you can omit trailing letters of the argument as long as there is no ambiguity with another argument (so the --output argument has the same meaning as the -o or -ou or -out or -outp or -outpu argument). A general overview of the testing procedure used in this program is given in the above figure. This program uses permutation extensively, so the entire procedure is computationally extremely expensive. Generally speaking, I recommended using 100 permutation cycles on 10 computational nodes (totaling 1000 permutation cycles) for generating GWA test statistic values, then run calculate_gsea.pl program on each of the 10 association results files and record 10 log files, finally use the combine_gsea.pl program to combine the 10 log files together to generate the pathway significance file. (The need to run 100 permutations on 10 computational nodes is a practical one: for a 4000 sample study with 500K SNP markers, it takes 24-48 hours to finish 100 permutation cycles by the calculate_association.pl program). The entire procedure takes up to 3 days for this set up, which is generally acceptable. The program requires three main input files, an association results file, an association permutation results file, a SNP-gene mapping file and a pathway definition file. Their formats are briefly described below. The association results file contains chi2 values (or alternatively, P-value) for genome-wide association tests on all markers to be tested in pathway-based approaches. It has a simple two-column format separated by tab character: the first column is marker name, while the second column is the chi2 value. If you happen to use calculate_association.pl program to calculate the chi2 and P-values in 1000 permutation cycles, this file can indeed be easily generated from the association permutation results file (see below), by taking the second and sixth column of the association permutation results file. The permutation results file contains test statistic values for all SNPs for all permutation cycles, with one marker per line. The first line of the permutation file is called header line, and this line tells the program which column is the correct column to use for association results in the subsequent lines. Each line contains 10 tab-delimited columns, and the first three columns are general description of the SNP marker, while the rest columns are information on the markers in the data set. The calculate_gsea.pl program will look for the CHI2_PERM label (the ninth column) in the header line, and then take the ninth column in every subsequent line for analysis. This column contains 10 numbers separated by comma, representing 10 chi2 values generated from 10 permutation cycles. If you use other GWA program (such as PLINK) to perform the association tests, you can use 1000 randomly generated phenotype description files and feed them into PLINK for association analysis, then take all the association results, and then reformat them into the above file format. Note only the “Marker” column and the “CHI2_PERM” column are necessary for calculate_gsea.pl program to work properly, so you do not need to generate other columns. The SNP-gene mapping file is another tab-delimited file, with three columns per line: SNP name, gene name and SNP-gene distance. I have provided several SNP-gene mapping files for markers in the Illumina and Affymetrix SNP arrays. For example, for the HumanHap550 array, several files are provided: hh550.hg18.snpgenemap and hh550.hg18.snpgenemap.exp20k. The difference is in how “gene” is defined: hh550.hg18.snpgenemap considers a gene as a RefSeq transcript, but hh550.hg18.snpgenemap.exp20k considers a gene as a RefSeq transcript plus the 20kb upstream and plus the 20kb downstream. To explain this more clearly, consider a transcript that is located in chromosome 1 from base position 3000 to position 4000 (total length is 1000 base pairs). Although various databases (such as UCSC Gene or RefSeq Gene) call it as a "gene", in reality it is just a transcribed sequence. So if there is a transcription factor binding site at base position 2950 (50 bp upstream of the transcription start site), the TFBS will be considered as outside of the "gene". Many people believe that this is not the correct way to define gene, and they argue (based on many studies on cis regulatory elements) that 20kb up and downstream should all be defined as part of the "gene". This is the reason why I provide two different versions of the SNP-gene mapping file. Note that in the program, the user can also specify the -distance argument to filter out SNPs that are far away from genes to be considered in the pathway analysis, as SNPs that are close to a "gene" can be used to represent the significance of the gene. So if a user use -distance 100000 argument and the --mapfile hh550.hg18.snpgenemap.exp20k argument, the effect would be almost the same as using -distance 120000 argument and the --mapfile hh550.hg18.snpgenemap argument. The IDs of the two pathways are GO0015884 and GO0007447, respectively. I have provided several pathway files in the program package that contains ~2000 pathways, compiled from Gene Ontology database, BioCarta database and the KEGG database. In most cases, you can just use my compiled pathway file for a regular genome-wide association study. You can also test your own candidate pathway, by making a simple tab-delimited file: note that the first two columns are pathway ID and pathway description, respectively, and all other columns are regarded as gene names. Note that in previous distribution of this software package, all the pathways are contained within a single file. In the new version, three separate files are provided for each pathway source, so that users can easily test pathway enrichment on preferred pathway sources. The BioCarta and KEGG are compiled manually, so they are of much higher quality than the GO annotations; however, GO relies on both computer prediction and human annotation using various source of knowledge, including those gleaned from model organisms, so it provides a more broad spectrum of gene sets for testing enrichment. The GO file provided in this package is from GO level 4 in the hierarchy of Biological Process and Molecular Function. As mentioned before, performing 1000 permutations for GWA is very time-consuming, and follow-up calculate_gsea.pl also requires large amounts of memory for the 1000 permutations; therefore, it is generally recommended to split your job into 10 parts, each with 100 permutations. We can run the calculate_gsea.pl program on each part separately, each time generating a log file, and then use the combine_gsea.pl to combine the 10 log files together to generate a single test statistics for all candidate pathways. NOTICE: Reading permutation file gsea.cc10 ... Automatically setting --cycle argument to 10 ... Done with permuted statistic values for 48210 SNPs! Rearranging SNP stat values ... Done! NOTICE: permutation cycle 1 done! NOTICE: permutation cycle 2 done! NOTICE: permutation cycle 3 done! NOTICE: permutation cycle 4 done! NOTICE: permutation cycle 5 done! NOTICE: permutation cycle 6 done! NOTICE: permutation cycle 7 done! NOTICE: permutation cycle 8 done! NOTICE: permutation cycle 9 done! NOTICE: permutation cycle 10 done! To change the default snp-gene distance threshold, one can use the --distance argument. To change the default gene set size, one can use the --setmin and --setmax arguments. One can use the --log argument to save the results to a log file, so that multiple log files can be used in the next step. will test all gene sets that contains at least 50 genes. However, note that the use of -setmin depends on how the *.log files are generated. By default the -setmin 20 argument is in effect in the calculate_gsea.pl program; therefore, it is legitimate to use a more stringent threshold of -setmin 50, but using a -setmin 10 woud make no difference at all. Multiple parameters and files can be tweaked in the program, and they may generate quite different enrichment results. Below I briefly describe several changes that can be made in the association calculation. First, the association results file can be changed to exclude certain SNP markers. This program (of course) only tests the SNPs that are both in the association results file and in the association permutation results file. By simply excluding certain markers from the association results file, we would be only testing a subset of SNP markers and their surrounding genes. For this reason, when generating the permutation file, one should generally be using highly flexible exclusion criteria so that as many markers can be tested and recorded in the permutation file as possible (consider even using the --allmarker --cell 0 argument when running calculate_association.pl program). One can then remove markers from the association results file to selectively test a subset of markers; for example, markers with MAF (minor allele frequency)>0.05, with HWE (Hardy-Weinberg equilibrium) P>0.001, and with genotyping non-call rate < 0.01. (In addition, one can probably even also select all markers with association P value < 0.05 and only test on this subset of markers. I have not tested this idea). An additional note is that, for case-control studies, it is okay to use MAF>0.01 (default parameter for calculate_association.pl program and PLINK program), but for family-based association studies, it might be better idea to use MAF>0.05 or even higher (since under same sample size, it is much more difficult to achieve high chi2 values for family-based association studies for markers with low heterozygosity, which are difficult to be found to be transmitted from heterozygous parents). Next, the testing strategy can be changed for case-control studies. Right now the default association test is the allelic association test in the calculate_association.pl program and in PLINK program, but maybe the genotypic association test (or trend test) is more powerful (and less biased by genotyping error) in the case of large sample size. If you use calculate_association.pl program for case-control studies, then the --perm_method argument can be used to specify the permutation testing strategy. Third, the SNP-gene mapping file can be changed and the SNP-gene distance can be changed. I now provide multiple files for the commonly used genotyping platform, including Illumina HumanHap550 (v1 and v3 together) and Affymetrix Mapping 500K, genome-wide 5.0 and genome-wide 6.0 arrays. There are multiple gene annotation system for mapping SNPs to genes (for example, the Ensembl gene annotation, the UCSC known gene annotation, and the RefSeq gene annotation), and there are two possible genome build for such mapping (the 2004 and 2006 human genome build). In generally, I recommend using only the 2006 human assembly and only the RefSeq gene annotation, which are more popularly than other annotation systems. In addition, the --dist 500k argument should be used in calucate_gsea.pl, meaning that only SNPs within 500kb from a gene are used in analysis, because we do not want to use too many SNPs around large genes, or inappropriately assigning SNPs within un-annotated gene deserts to an unrelated gene. Finally, the pathway annotation file can be supplemented or even replaced. Right now several files are included in the package from GO level 4 annotation, the BioCarta database and the KEGG database. However, users may have much better gene pathways/sets annotations based on expert compilation or based on high-throughput techniques (such as co-regulated genes in microarray experiments and so on). As mentioned before, the gene set size can be also tweaked by the --setmin and --setmax arguments; note that gene set size is dependent on the actual ensemble of SNPs used in the analysis and will be different between different studies using different array platforms. In the absence of a permutation association results file, the calculate_gsea.pl can apply genotype-based permutation, that is, permutating the P-values and chi2 values between SNPs. This is not really recommended for SNP arrays with high marker-marker linkage disequilibrium (LD) patterns, as such permutation disrupts the LD structure and may generate biased results. Whenever possible, please use raw genotype data to performed phenotype permutation and re-calculate GWA statistics, before using the calculate_gsea.pl program. In general, one can also use the calculate_gsea.pl program for microarray data analysis, because it also implements the original GSEA algorithm, including the pre-ranked module of the original GSEA algorithm. However, the original authors of GSEA also provide software for such analysis (Subramanian et al, GSEA-P: a desktop application for Gene Set Enrichment Analysis. Bioinformatics, 23:3251-3253, 2007), which is written in Java and is far more user-friendly than my program. Unless the user wants to tweak my program for more customized analysis or more automated analysis on huge data sets, the Java program is probably a better choice for microarray data analysis. These two programs do generate highly similar results on identical data sets. The --weight argument corresponds to the p value in the GSEA enrichment score calculation formula. By default, this parameter is chosen as 1, which is identical as the original GSEA publication in PNAS for microarray data. However, for GWAS data, other values could be explored and see how results change. In practical settings of GWAS studies, the value of 1 still seems to be a reasonable choice for testing. The most appropriate choice will probably need to be dependent on the disease model: if it is indeed a complex disease without any single variant achieving significance, then default p should be used. If a few variants achieves very high significance (for example, diseases like type 1 diabetes and ulcerative colitis with a large HLA involvement), then a large p parameter will easily bring the pathway containing the SNPs to the top ranked list. The --traditional argument signals the program to use the same normalized enrichment score calculation method as the PNAS paper on microarray data, and use the same dichotomization method for FDR/FWER calculation. This makes sense for microarray data analysis, since genes expression in a pathway could be both up-regulated or down-regulated; however, for GWAS studies, the lack of significance for SNPs within a pathway is not biologically interesting or interpretable.